Design work on a new family of pistols commenced in September 1989 focused primarily on the United States commercial and law enforcement markets. USP prototypes participated in rigorous testing alongside H&K's entry in the Offensive Handgun Weapon System (OHWS) program requested by the U.S. Special Operations Command (USSOCOM) and which would later result in the Mk 23 Mod 0. 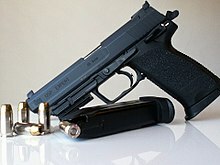 The USP prototypes were then refined in 1992, based on input from the OHWS trials, and the design was finalized in December of the same year. The USP was formally introduced in January 1993 with the USP40 model (the base version) chambered for the increasingly popular .40 S&W cartridge, followed soon by the USP9 (using the 9×19mm Parabellum cartridge), and in May 1995—the USP45 (caliber .45 ACP). In contrast to the ambitious and innovative P7, P9S, and VP70Z designs, the USP uses a more conventional Browning-style cam-locked action, similar to that used in the Hi-Power - but with a polymer frame. The USP is a semi-automatic pistol with a mechanically locked breech using the short recoil method of operation. This rather conventional lock-up system has a large rectangular lug over the barrel’s chamber that rides into and engages the ejection port cut-out in the slide. When a cartridge is fired, pressures generated by the ignited powder drive the cartridge casing back against the breech face on the slide, driving back both the barrel and slide as they remain locked together in the manner described above. After 3 mm (0.12 in) of unrestricted rearward travel, the projectile has left the barrel and gas pressures have dropped to a safe level. A shaped lug on the underside of the barrel chamber comes into contact with a hooked locking block at the end of the steel recoil spring guide rod, lowering the rear end of the barrel and stopping the barrel's rearward movement. The recoil spring assembly is held in place by the slide stop lever’s axis pin and a round cut-out at the front of the slide. For enhanced reliability in high-dust environments, the locking surface on the front top of the barrel’s locking lug is tapered with a forward slope. This tapered surface produces a camming action which assists in positive lock-up in the presence of heavy fouling and debris. In this way, the USP shares many design features with the M1911 pistol, although apparently updated for easier operation. One of the most significant features of the USP is the mechanical recoil reduction system. This system is incorporated into the recoil spring assembly, located below the barrel and consists of a heavy, captive coil spring around the guide rod. Designed primarily to buffer the slide and barrel and reduce recoil effects on the pistol components, the system also lowers the recoil forces felt by the shooter up to 30%. The USP recoil reduction system is insensitive to ammunition types and does not require adjustment or maintenance. It functions effectively in all USP models. Using this same recoil reduction system, one of the related H&K Mk 23 .45 ACP pistols fired more than 30,000 high pressure +P cartridges and 6,000 proof loads without damage or excessive wear to any major components. Abuse and function-testing of USPs have seen more than 20,000 rounds of .40 S&W fired without a component failure. Milspec environmental tests were conducted in high and low temperatures, in mud, immersed in water and in salt spray. In one particular test, a bullet was deliberately lodged in the barrel and another bullet was fired to clear the obstruction. The barrel was successfully cleared with only minor structural deformation and continued to produce consistent groups when test fired for accuracy. Major metal components on both the USP and Special Operations Pistol are corrosion-resistant. Outside metal surfaces, such as the steel slide are protected by a proprietary "Hostile Environment" nitride finish. Internal metal parts, such as springs, are coated with a Dow Corning anti-corrosion chemical to reduce friction and wear. The USP is composed of a total of 54 parts and is broken down into 7 major components for maintenance and cleaning: the barrel, slide, recoil spring, recoil spring guide rod, the frame, slide stop and magazine. This is done by retracting the slide back to align the slide stop axis pin with the disassembly notch on the left side of the slide and withdrawing the axis pin. The USP was originally built around the .40 S&W cartridge, but a 9×19mm Parabellum was introduced at the same time. In May 1995, Heckler & Koch introduced a .45 ACP variant. The USP Compact series was introduced in 1996 and is available in 9 mm Parabellum, .40 S&W, .45 ACP, and, exclusively to the Compact model, .357 SIG. 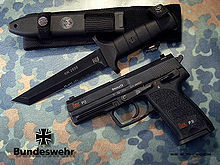 Other variants of the standard USP include the USP Tactical, USP Expert, USP Match, USP Elite and the standard sidearm of the German Armed Forces (Bundeswehr)—the P8. 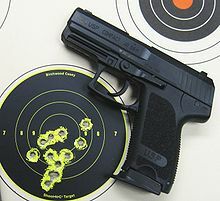 One of the unique features of the USP is the wide variety of the trigger styles available, which may be quickly swapped. 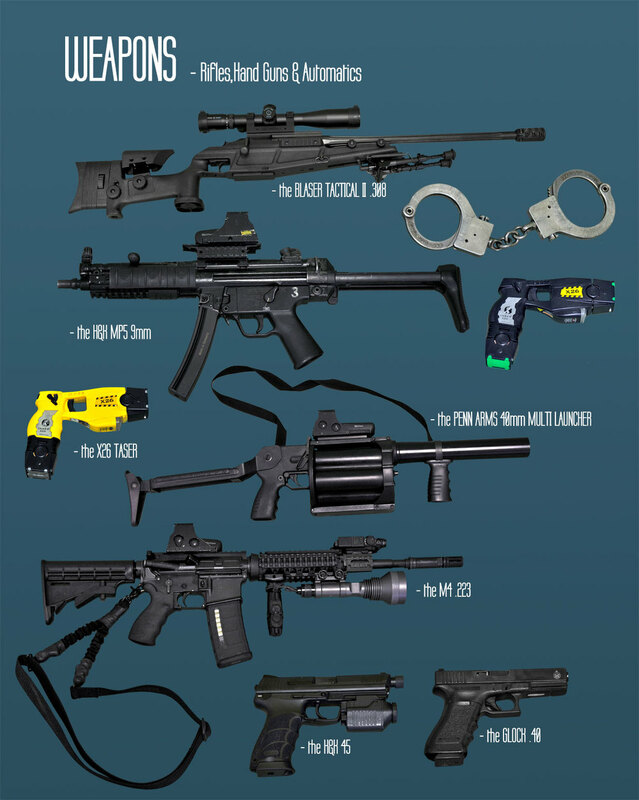 There are nine commercially available modifications (called "variants" by HK). By using a modular approach to the internal components, the control functions of the USP can be switched from the left to the right side of the pistol for left-handed shooters. The USP can also be converted from one type of trigger/firing mode to another. This includes combination of double-action and single-action (DA/SA) and double-action only (DAO) modes. In addition to a wide selection of trigger/firing modes, the USP has an ambidextrous magazine release lever that is shielded by the trigger guard from inadvertent actuation. The rear of the USP grip is stepped, and combines well with the tapered magazine to allow for rapid reloading. Finger recesses in the grip frame also aid in magazine removal. On 9 mm and .40 caliber USPs, magazines are constructed of polymer reinforced with stainless steel. Magazines on the USP .45 are all-metal. All USP magazines will drop free of the pistol frame when the magazine release is depressed. Also, the USP does not have a magazine lockout feature (also known as a magazine disconnector). Thus, it is possible to fire a chambered round even with the magazine removed. An extended slide release lever is positioned to allow easy operation without changing the grip of the shooting hand. Variants 1 (lever on left) and 2 (lever on right) allow the user to carry the pistol in a single-action mode (cocked and locked) with the manual safety engaged. This same pistol, without modification, can be carried in double-action mode, with or without the manual safety engaged, and with the benefit of a decocking lever. Variants 3 (lever on left) and 4 (lever on right) provide the user with a frame-mounted decocking lever that does not have the "safe" position. This combination only allows the hammer to be lowered from SA position to DA position. It does not provide the "safe" position to prevent the pistol from firing when the trigger is pulled. For the double-action-only user, variants 5 (lever on left), 6 (lever on right), and of the USP operate as double-action-only pistols, with a bobbed hammer always returning to the DA position (forward) after each shot is fired. To fire each shot, the trigger must be pulled through the smooth DA trigger pull. Variants 5 and 6 have a manual safety lever. No control lever is provided on variant 7. Variants 9 (lever on left) and 10 (lever on right) allow the shooter to carry the pistol in a single-action mode (cocked and locked) with the manual safety engaged. This same pistol, without modification, can be carried in double-action mode (hammer down), with or without the manual safety engaged. The double-action mode offers a second-strike/double-action capability in case of a misfire. The control lever has no decocking function on variants 9 and 10, so one would have to carefully lower the hammer manually (or keep the safety on, remove the magazine, and eject any round in the chamber before lowering the hammer). Developed especially for the U.S. government, the Law Enforcement Modification (or LEM for short), is a USP DAO (Double-Action Only) model with a unique trigger mechanism. This mechanism improves the double-action trigger performance and reduces the weight of the DAO trigger pull to 7.5–8.5 pounds-force (33–38 N), uses a stronger hammer spring, and shortens the trigger reset. Aside from the LEM mechanism, it is identical to the USP Variant 7 (DAO) model. Almost identical to the standard USP, the Custom sport is aimed at target- and practical shooting users. The Custom Sport has a match grade barrel, match trigger and adjustable sights. The USP Compact in .40 S&W. The first USP Compact models appeared in 1996. These are scaled-down USPs, and are available in all the same cartridges as the full size version, and additionally the .357 SIG. Due to the smaller size of the frame, magazines for the Compact variant may have a handgrip extension to better accommodate the shooter's hand. Standard flat floorplates are also available for the USP Compact magazines. The USP Compact comes standard with a bobbed hammer equipped with a flat rubber external thumb grip. This reduces possible snag from the hammer on a holster or clothing while the pistol is being drawn, but still allows the USP Compact to be cocked from a decocked position even in the absence of a spurred hammer. This can be done since decocking the weapon does not fully drop the hammer, leaving it in a somewhat "half-cocked" state. The USP Compact cannot be cocked from a dry-fired position as the hammer will be flush to the back of the slide. However, the operator could pull the trigger approximately halfway back in a dry-fired position to put the hammer in a half-cocked state, allowing the hammer to be fully cocked with the thumb. A spurred hammer, similar to the one that comes as standard on the P10, can be installed onto the USP Compact. USP Compact models lack the mechanical recoil reduction system of the larger full sized USP pistols. Instead, a more compact recoil buffering system is composed of a polymer bushing, around the captive recoil spring, which is designed to absorb energy at the end of the slide's travel rearward. This polymer bushing, with an estimated lifespan of around 20,000 rounds, is used instead of the double spring/captive recoil spring/guide rod found in the full sized USP. In addition to the variants previously described for the full size USP, an ambidextrous safety is available from the manufacturer as a separate part. After installation, the USP Compact effectively becomes a right or left-handed firearm with respect to the decocker and manual safety functions. Heckler & Koch do not authorise caliber conversions, but a separate barrel for a .357 SIG or .40 S&W can be purchased from HK or from aftermarket companies. HK USP9SD (tactical) of the Pasukan Gerakan Khas, fitted with Brügger & Thomet sound suppressor, Picatinny pistol rail and Aimpoint Micro T-1. The USP Tactical (9mm Parabellum, .40 S&W, .45 ACP) incorporates a fully adjustable rear sight, a higher-profile front sight (as to be visible above the suppressor), an extended threaded barrel and O-ring, a match grade trigger, and an adjustable trigger stop (the 9mm model, referred to by HK as the "USP9SD (tactical)" does not have the match trigger with adjustable trigger stop, O-ring, and does not carry the "Tactical" marking on the slide that the USP40 and USP45 Tactical models do, making it essentially a full size USP9 with threaded barrel and raised & adjustable target sights, but those features were added to it in 2015). Sound suppressors designed for the USP Tactical are available from Brügger & Thomet and Knight's Armament. 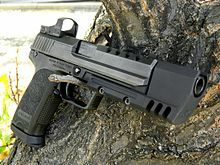 A unique feature of the USP Tactical is that the barrel is left-hand threaded (counter-clockwise to tighten), which makes the pistol incompatible with suppressors designed for the MK23 Mod 0. The KSK of the German Army and the German Navy Kampfschwimmer use the USP Tactical under the designation "P12". The USP45CT Compact Tactical is a .45 caliber handgun developed for U.S. special operations use that combines features of the full-size USP45 Tactical pistol in a smaller, more concealable package. Features include an extended threaded o-ring barrel with polygonal bore profile and taller sights enabling use of sound suppressors. These two features may hinder the use of holsters designed for standard USPC pistols. Standard USPC barrels do not feature the o-ring. The USP CT is .45 caliber only and is not offered in 9mm, .40 or .357 SIG. The USP Expert (9 mm Parabellum, .40 S&W, .45 ACP), was introduced in 1998 and includes all the features of the Tactical, with the exception of the threaded barrel. The USP Expert also retains the USP match trigger. It also features an extended steel slide, which mostly hides the longer O-ring barrel and adds weight to help reduce muzzle flip and felt recoil even further. The Expert has adjustable target sights similar to the USP Match, Elite, and Tactical, however the slide differs in that the rear sight seat has been milled lower. The Expert may be used with an extended magazine well, or jet funnel, in 9 mm and .40 S&W calibers, which is intended for use in conjunction with larger-capacity magazines. The Jet Funnel magazines are clear plastic and hold 18 rounds for 9mm, and 16 rounds for .40 S&W. The jet funnel magazine can be used without the jet funnel installed and will protrude slightly from the bottom of the magazine well. However, once the jet funnel is installed, only jet funnel magazines can be used. The standard USP magazines will not work as the funnel will impede them from fully inserting in the grip and locking into place. The bobbed hammer was a factory option for the Expert if it was to be used in IPSC for the Standard Division, as the original version "in its ready condition" did not fit the box for Standard division in IPSC. The USP Match (9 mm Parabellum, .40 S&W, .45 ACP) has the same features offered on the Expert, except for a barrel weight that replaces the elongated slide found on the Expert. This weight is said to provide a recoil counterbalance to aid in target tracking. It was discontinued in 1999. Highly Modified USP 45 by Adam Rogers. The USP Elite (9 mm Parabellum, .45 ACP) takes features found on the Tactical, Expert, and Match models, and combines them with a 6.02 in (153 mm) barrel and hand-fitted 9.25 in (235 mm) extended slide. The Elite also includes higher-profile fully adjustable front and rear sights. Certain models of this gun also have a slightly longer slide release, or have the mechanism itself moved further toward the grip, for increased comfort. The Elite is slightly more accurate, but longer and somewhat hard to carry for uniformed personnel. Most USP Elite models are used as target pistols and can be found in many competitions. The USP has an accessory rail at the front of the frame that allows for attachments of aftermarket equipment like laser sights and weapon lights. The rail is of proprietary design (versus the more common picatinny rail) so equipment options are limited when compared to other tactical pistols. For instance, one of the few weapon lights compatible with the USP is the UTL (Universal Tactical Light) made by Insight Technology and is only available through H&K dealers. As a workaround, some companies have offered adapters that convert the USP's rail for use with attachment that mount to picatinny rails. SureFire makes adapters for both the USP and USP Compact that are compatible with their accessories, and GG&G makes the two similar adapters for compatibility with Streamlight's TLR range of weapon lights and lasers. In theory, since both companies' adapters use the semi-standard picatinny design, the adapters should accept any standard pistol mounted weapon light, but because the USP has such a large trigger guard and since there is no strict standard for rail placement, some lights may not be within finger reach of the operator. Attachment of specialty equipment to the USP requires a specialized gunsmith to complete the work. As the USP was developed at the same time as the SOCOM MK23, the pistol underwent much of the same rigorous testing. The barrel is cold-forged from chromium steel for increased life. USP barrels post November of 1994 use a polygonal profile, whereas 1994 and earlier models utilize traditional 'land and grooves' rifling. During testing, a bullet was deliberately lodged in a USP barrel. Another cartridge was then fired into the obstructing bullet. The second bullet cleared the barrel, resulting in a barely noticeable bulge. The pistol was then fired for accuracy and the resulting group measured less than 4 inches at 25 meters. Temperature testing required the USP be frozen to −42 °C and fired, frozen again, and then be heated up to 67 °C and fired. These temperature tests were continually repeated with no adverse effects on the USP. The gun was also subjected to NATO MIL-SPEC mud and rain tests, which were passed without difficulty. Water immersion and salt spray also presented no problems. German Navy combat divers have used the USP for two years without any signs of corrosion. Safety testing exceeded the ANSI/SAAMI requirements adopted in May 1990. These included dropping a USP with a primed cartridge and decocked hammer on a variety of hard surfaces without discharging. The USP surpassed these commercial requirements, as well as German Army and police tests, including repeated drop tests from six feet (1.8 m), hammer first, onto a steel backed concrete slab. Proof round firing resulted in no cracks, deformations, or increase in head space. Attempts to fire the USP pistol with an unlocked breech proved unsuccessful. Testing with a variety of ammunition proved the USP meets these high standards. During the USP testing phase, it was shown the recoil-reduction system reduces the force on the USP grip to approximately 300 newtons (67 pounds-force). Peak force shock on competing .40 caliber polymer and metal framed pistols was around 5,000 newtons (1,100 pounds-force). The primary benefit of low peak shock is a decrease in wear and tear on pistol components, a great concern with the +P cartridge in 9 mm, .40 S&W, and .45 ACP. Reduction of peak shock forces also contributes to softer recoil for the shooter, although these "felt recoil" values are much more subjective. KM2000 knife & P8 pistol of the Bundeswehr. 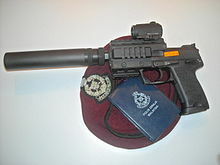 The USP was adopted in Germany by the Bundeswehr (German armed forces) as the P8 in 1994. The P8 has only minor differences from the standard USP model, these being translucent magazines, a reversed safety/decocker lever (on the P8, down indicates 'safe', and up indicates 'fire' — this is the opposite of the standard USP), and the 'S' and 'F' letters being printed onto the frame instead of onto the lever itself. The P8 has a traditional lands-and-grooves barrel instead of a polygonal barrel. The P10, adopted by many German State Police forces, is in fact a USP Compact with the addition of a spurred hammer. Both P8 and P10 are chambered in 9×19mm Parabellum (9mm NATO) only. In 1998, the H&K USP Compact with the LEM trigger action, in .40 Caliber Smith & Wesson, was adopted by the United States Immigration and Naturalization Service as the duty sidearm for its Special Agents and plain clothes officers. In 2004, when the I&NS's criminal investigations branch was merged with the U.S. Customs Service's Office of Investigations, into the U.S. Department of Homeland Security's Homeland Security Investigations, the former I&NS Special Agents continued to carry the USP Compact. New duty pistols, the SIG Sauer Model P229 DAK, in .40 Caliber Smith & Wesson, were eventually issued to the HSI Special Agents when the new pistol contracts were awarded by DHS. On August 24, 2004, SIG Sauer and Heckler & Koch/HK Defense won major pistol contracts with the United States Department of Homeland Security. The contract was valued at $26.2 million. The HK pistol models chosen were the HK P2000 US, HK P2000 SK Subcompact, and the USP Compact/LEM (Law Enforcement Modification). The LEM trigger is basically HK's version of SIG's DAK trigger and vice versa. According to the company, the LEM trigger allows for faster follow-up shots (repeat shots) on target than a standard double-action-only system, due to a lighter trigger pull (7.3–8.5 lbf) and shorter trigger reset than standard DAO trigger systems. The LEM trigger utilizes a two-piece "pre-cocked hammer" composed of a cocking piece and an external hammer. The hammer is pre-cocked when a round is chambered (slide is cycled). The LEM system supposedly also provides for more reliable primer ignition, since it utilizes a stronger hammer spring. The LEM trigger can be installed on existing USP Compact pistols that were purchased before the LEM trigger came on the market—either by a certified gunsmith or by sending the pistol directly to Heckler & Koch. In addition, the USP Compact pistol can retain its external safety even with the LEM trigger—making it the only modified double-action pistol with an external safety. A German Navy boarding team member assigned to the frigate FGS Augsburg (F213) provides security with a P8 pistol for the remainder of his team as they board a local cargo ship by fast rope to conduct a search of the vessel. German Bundeswehr soldiers using a G36 rifle and a HK P8 in a military exercise. Irish soldier training with USP. 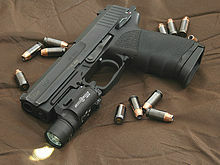 ^ a b "Heckler & Koch :: Product Overview - USP Elite". heckler-koch.com. ^ a b c d e f g h i j k l m n o p q r s t u v w x y z aa ab ac ad ae af ag ah ai "Heckler & Koch USP (Universal Self-Loading Pistol) Semi-Automatic Pistol (1993)". Military Factory. June 22, 2014. Retrieved 2014-12-23. ^ a b Heckler & Koch USA. "Heckler & Koch USP Pistols". Archived from the original on 2008-04-10. Retrieved 2008-07-28. ^ a b Heckler & Koch Global. "USP: Specifications". Retrieved 2008-08-03. ^ a b c d Heckler & Koch Global. "USP". Retrieved 2008-07-28. ^ "New HK Handguns for 2015". January 19, 2015. Retrieved January 19, 2015. ^ Heckler & Koch USA (March 2007). HK USP, USP Compact Pistol & USP Specialty Pistols Operators Manual (PDF). p. 40. Archived from the original (PDF) on 2011-07-11. ^ "German police and submachine guns [Archive] - Military Photos". Militaryphotos.net. Retrieved 2008-12-26. ^ Lee, Jerry (15 July 2014). Gun Digest 2015. Iola, Wisconsin: F+W Media. p. 1392. ISBN 978-1-4402-3918-2. ^ Insight Technology. "Tactical Lights - FAQs". Archived from the original on 2006-03-21. Retrieved 2010-05-12. ^ GG&G. "USP Rail Adapter". Retrieved 2010-05-12. ^ "Heckler & Koch". facebook.com. ^ a b Streetpro. "Heckler and Koch USP Torture Test". Retrieved 2008-08-03. ^ a b Heckler & Koch Global. "Pistole P8". Retrieved 2008-07-28. ^ a b Heckler & Koch Global. "Pistole P10". Retrieved 2008-07-28. ^ "Department Of Homeland Security Awards Handgun Contracts" (Press release). Department of Homeland Security. 2004-08-24. Archived from the original on 2008-07-26. Retrieved 2008-07-28. ^ Crane, David (2004-08-29). "SIGARMS and Heckler & Koch/HK Defense Win Major Pistol Contracts with DHS". Defense Review. Retrieved 2008-07-28. ^ "Up in arms". ssaa.org.au. ^ a b Kemp, Ian (December 2008). "Individual Weapons - Combat Pistols: Poised for a Shift". Asian Military Review. Archived from the original (PDF) on 2013-09-28. Retrieved 2009-10-01. ^ "RAAF base hold simulated training". Queensland Times. ^ "Politiets Våben" (in Danish). BT. Retrieved 2010-04-12. ^ a b Jenzen-Jones, N.R. ; McCollum, Ian (April 2017). Small Arms Survey, ed. Web Trafficking: Analysing the Online Trade of Small Arms and Light Weapons in Libya (PDF). Working Paper No. 26. p. 63. ^ Kommersant (2005-12-27). 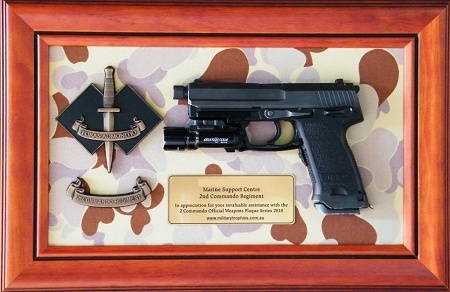 "Estonian Army Replaces Pistol of Makarov". Archived from the original on 2008-12-29. Retrieved 2008-07-28. ^ "Pistolet automatique - HK USP Compact Marine National" (in French). Le ministère de la Défense. Archived from the original on 2009-01-29. Retrieved 2009-01-22. ^ Le ministère de la Défense. "Pistolet automatique - HK USP" (in French). Retrieved 2008-08-16. ^ "Heckler & Koch :: Home". heckler-koch.de. ^ "Armament of the Georgian Army". Geo-army.ge. Archived from the original on 2012-03-09. Retrieved 2013-01-01. ^ a b "RIEAS Research Institute for European and American Studies". rieas.gr. ^ Lavery, Don (2006-09-02). "Defence Forces to turn 'tomb raiders'". Independent.ie. Retrieved 2008-07-28. ^ Huges, Capt Brian (April 2007). "Taking Aim" (PDF). An Cosantóir. 67 (4): 6. Retrieved 14 November 2016. ^ 陸上自衛隊唯一の特殊部隊 特殊作戦群の解説 (in Japanese). Archived from the original on 2012-11-29. Retrieved 2012-11-28. ^ "Lietuvos kariuomenė :: Titulinis". kam.lt. ^ Lasterra, Juan Pablo (2004). "UPS Unidad Especial de la Policia Luxembourguesa" (PDF) (in Spanish). ARMAS Magazine. Archived from the original (PDF) on 2011-07-22. Retrieved 2009-09-23. ^ Thompson, Leroy (December 2008). "Malaysian Special Forces". Special Weapons. Retrieved 2009-12-14. ^ "//- Strona poświęcona Wojskowej Formacji Specjalnej GROM -//". grom.mil.pl. Archived from the original on 2011-08-14. Retrieved 2011-08-06. ^ "AFEGANISTÃO: UNIDADE DE PROTECÇÃO DA FORÇA EM OPERAÇÕES - Operacional". operacional.pt. ^ "Specijalne-jedinice.com - HK-USP". specijalne-jedinice.com. ^ "Singapore Police Force - Police Life Monthly". spf.gov.sg. Archived from the original on 14 July 2007. ^ "Heckler & Koch Defense Wins Transportation Security Administration Pistol Contract". Heckler & Koch. ^ "State Police: Maine State Police History". maine.gov. Kokalis, Peter (2001). Weapons Tests And Evaluations: The Best Of Soldier Of Fortune. Boulder, Colorado, USA: Paladin Press. ISBN 978-1-58160-122-0.